We are in the middle of the chilly weather season here in Panama City right now. Our imagination is swirling with the thoughts of hot days on the beach and splashing in the warm waters of the Gulf of Mexico. It won’t be long now, Spring is right around the corner. So, let’s get started on the top-three ways to have fun in the water in Panama City this Spring. Number 1. 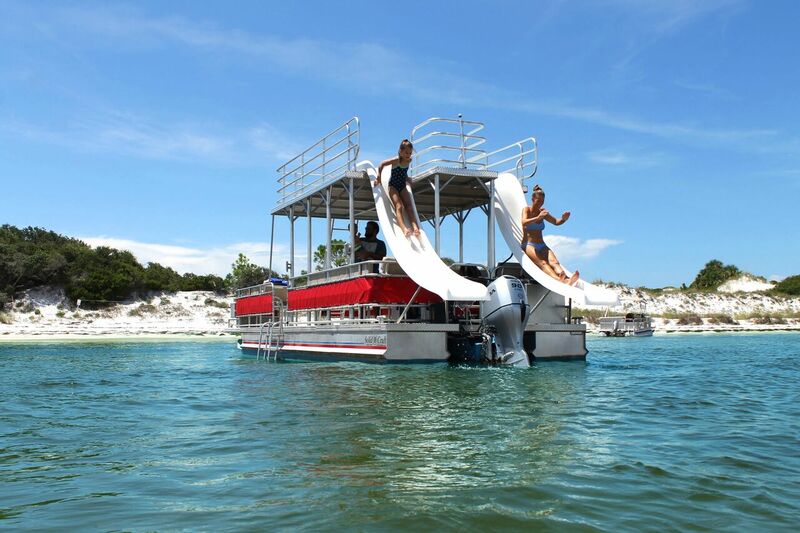 Put on your bathing suit, grab your cooler and 11 of your closest friends and rent a double-decker pontoon boat at Shell Island Pontoon Rentals in Saint Andrews State Park. You will be able to cruise the waters near Shell Island which is a very popular attraction in the South East. The boat has dual slides off of the back where you and your friends can enjoy hours of fun racing down and splashing into the clear water. This is an experience that the kids and young a heart will not soon forget! Number 2. Did you not get enough time on the slides on the Shell Island Pontoon double-decker pontoon boat? Then head on down to Shipwreck Island Waterpark and enjoy everything this 20-acre fun park has to offer. Shipwreck Island Waterpark opened in the summer of 1983. The tropical theme waterpark is filled with attractions and food and beverage outlets to bring smiles to every member of your family. The park features lush landscaping, a professionally trained aquatics staff, and is one of the most hospitable attractions in all of North Florida. Shipwreck Island has been entertaining families for over thirty-three years on Panama City Beach. You can’t beat the fun you and your family will have at Shipwreck Island. Number 3. Maybe slides are not your thing, maybe it is getting out on the open ocean for a fishing trip! Try the Stingray Fishing Charters out of Panama City. You will enjoy the new 34′ tournament grade center console vessel that is fast, stable and can get you out fishing quickly and safely. The Stingray is completely equipped with state of the art electronics and rigging. While on board, guests can enjoy having the privacy of a full head and a fresh water shower when needed! You also can count on using our top of the line Daiwa, Shimano and Penn reels, rods and tackle!! They take care of all of your needs so all you need to do is hook into a nice fighting fish! Talk about a memorable day for your family and friends! A day on the high seas! There are many other ways to spend your days in the water around Panama City, Florida. We suggest you try these three first and see what you like and then try a few more ways to play in the waters of the Gulf Of Mexico. Just have fun!